Paloma Herrera at the curtain call of her retirement performance. Photo by Gene Schiavone. She entered the stage to a roar of applause, pausing on the tips of her toes, exhaling and taking in the cavernous Metropolitan Opera House. Was this the title character Giselle, breathing in a new day and unaware of the tragic fate before her, or a veteran performer relishing her final moments on a stage? The music continues without her, she skips ahead, catching up with an easy smile. This is home. So began the first of American Ballet Theatre's farewell performances this season. 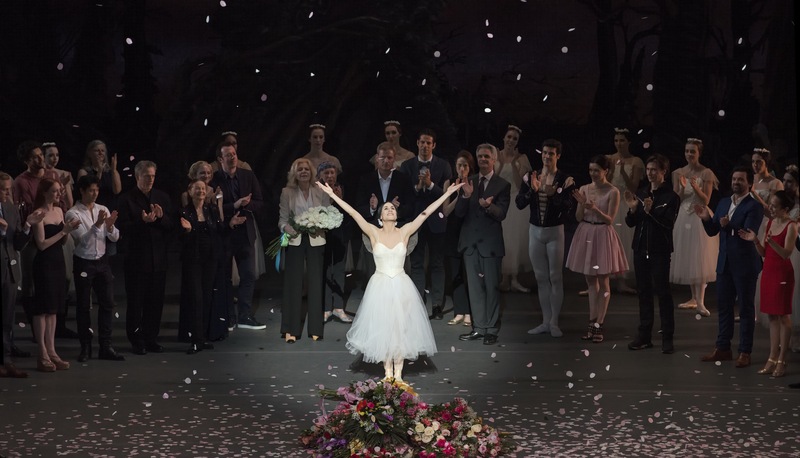 Paloma Herrera, the first of three star ballerinas who have defined a generation of artistry, bid her farewell to New York with minimal fanfare at the Wednesday matinee of Giselle. She started dancing in her native Argentina at age seven at the Teatro Colón, winning a slew of ballet competitions, before being invited to enroll at the School of American Ballet at 15. After performing the lead in Raymonda Variations at the school's workshop, she auditioned for ABT and received a contract on the spot. "If Herrera continues as she has begun, she could become the outstanding American ballerina of her generation." said dance critic Joseph Mazo, echoed by his colleague Anna Kisselgoff as "the spirit of rebirth" at ABT. At 19, Herrera became the youngest Principal Dancer in the company's history, a prodigy in the tutu-and-tiara ballets that are the staple of ABT's repertory. Paloma Herrera and Roberto Bolle in Giselle. Photo by Gene Schiavone. I remember first seeing Herrera perform ten years ago when I first moved to New York, and since then in every classical warhorse ballet imaginable. She possesses a crystalline technique paired with a natural lyricism and ease about her movements. She is also dynamic, whipping off turns and blazing through jumps at lightning speed. The best place to see this is her as Kitri, the ballerina in Don Quixote, which catapulted her to international stardom in her early days in the company when she was still in her teens. I remember seeing ABT's Don Quixote last season shortly after Paloma's retirement was announced. With the ballet not in repertory the following season, some of us in the audience realized midway through the performance: Oh my God, this is Paloma's last Don Q. She looked dazzling, holding her balances on the tips of her toes as long as possible to the growing cheers from the audience. And then just like that, it was over. Herrera moved up her retirement performance from her original exit in ABT's new production of The Sleeping Beauty to Wednesday's Giselle, because "I don't feel comfortable with [The Sleeping Beauty], I wanted to do something that I've done a lot with ABT." Performing alongside Roberto Bolle as her Albrecht, Herrera has chosen a production which she has danced season after season to great acclaim, compared often to Hamlet in terms of its dramatic demands. The performance was different than other performances of Giselle - much more was at stake. Instead of Albrecht experiencing one last encounter with the spectral title character, it was in fact that audience who found themselves grasping to take in the final moments of Herrera's interpretation. While more appropriate in Don Quixote, she lingered in her balances in the first act solo, a final tease to an expectant audience. A woman behind me gasped "What?!" as Herrera finished the devilishly quick turns to finish. Her mad scene was jarring, Herrera's eyes darting around the stage, hearing the calls of the Willis in her head. In the second act, Thomas Forster as a sympathetic Hilarion was the first victim of the ghostly Willis, condemning men to dance to their deaths. Devon Teuscher, replacing Veronika Part, was ethereal as Myrtha, Queen of the Willis. Bolle replaced Albrecht's series of brisés with 32 entrechat six, a more and more frequent substitution for male dancers, squarely punctuating the most rhythmic and driving section of Adam's luscious score. The ballet ends with Albrecht reaching for Giselle as she vanishes back into the mist, her soul finally at rest. She no longer has to dance. Bolle reaches for Herrera in those final moments, in this performance, he is us, grasping the last visual pictures of this great performing artist on stage. The curtain closes on Bolle, a proxy for the audience, delicately holding a single white lily and in awe of what he just experienced. There were tears and muffled sobs from the balletomanes around the theater, interspersed with tourists bustling out, unaware of the special nature of the performance. The fans that stayed were treated to a parade of American Ballet Theatre's dancers and crew, who came out to greet Herrera as she took her final bows. A zigzag of corps girls dropped flowers on a growing pile at center stage, and one by one the Principal artists of the company came out to pay their respects to a colleague under a slow but constant trickle of confetti. From the audience, a sea of glowing cell phones bubbled up to record the moment, as choruses of "PA-LO-MA! PA-LO-MA!" reverberated through the Metropolitan Opera House. Within ten minutes, the bows were over, and the audience spilled out of the air conditioning and onto the baking concrete sidewalks of New York. And just like that, it was over.